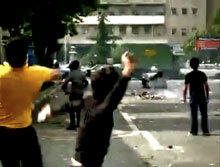 FRAGMENTS OF A REVOLUTION goes beyond the headlines and the tweets to tell the story of the protests that swept Iran in the aftermath of the disputed 2009 presidential election. 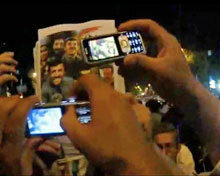 Directed by an anonymous Iranian living in exile, the film brings together clandestinely sent emails, online videos and footage shot by protesters in the midst of demonstrations. FRAGMENTS OF A REVOLUTION is, of necessity, a highly unconventional documentary—one in which the director relies on anonymous correspondents within Iran and on YouTube footage. The director feels as though he or she has been living in a "virtual Tehran" for eight months—watching distressing images from the homeland and trying to reconstruct the story of what happened. This unusual process leads to a film with an astounding immediacy. We alternate between events in Tehran and the anonymous director's attempts to make sense of them—until the two storylines converge in early 2010. As the protest movement grows, we are privy to the immediate experiences of those on the ground: women picking up rocks to hand to protesters; people secretly filming police as they beat people, smash cars and target those in windows who are looking on; marchers coming under fire from rooftop snipers. Finally, the protests die down, and the forced confessions and show trials begin. "My hopes have become ashes," says the film's director. But under those ashes, embers continue to glow. FRAGMENTS OF A REVOLUTION is not the definitive, objective record of the powerful opposition movement that swept the country. But it is a remarkable and impressionistic inside view of the movement, through the images and words of those it most closely affected.